Put the taxes behind you and come out for a great night of music tonight at Slainte. 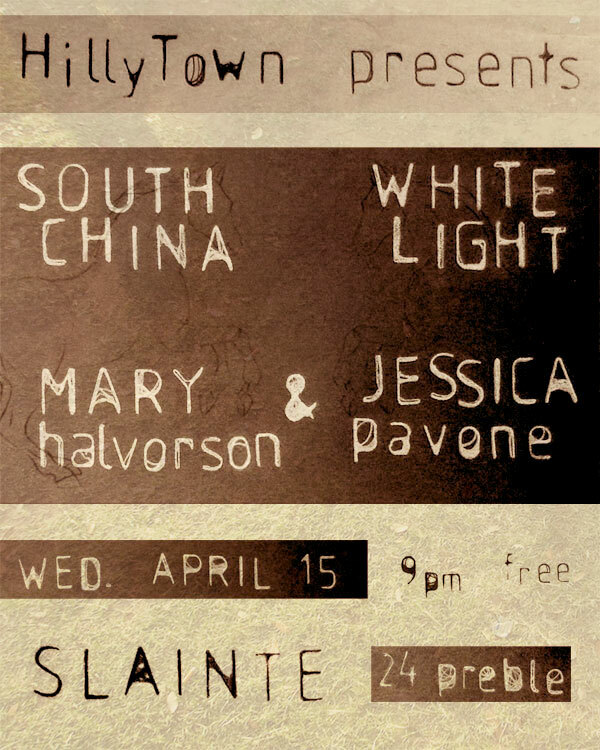 We’ve got locals White Light and South China (who sounded great together on WMPG’s Liberation By Sound yesterday) along with the Brooklyn duo Mary Halvorson & Jessica Pavone. As always at Slainte (24 Preble St. in downtown Portland, just off Monument Square) the show is free and begins at 9pm! Bonus: half off items on the bar’s food menu (which is surprisingly eclectic and really good – not your typical bar food!) See you there! Also tonight, just down the street at the Port City Music Hall, the Phoenix will be announcing the winners of their “Best Of 2008” poll, along with providing free food and some great musical performances. That starts early (7pm) so you could even stop there before out party!